Happy Friday, friends! Big weekend plans? Our office is closed today so I'm enjoying an extended weekend, which is nice because it's full of activity. Tomorrow I'm driving down to Le Sueur to meet up with my oldest friend Emily to go get fitted for a bridesmaid dress for her upcoming nuptials. I consider it a small victory that I've dodged the wedding bullet for 28 years and I couldn't be happier that I'm finally taking one for Em. Sunday is of course Easter and that means ham and fam. There will likely be some running and yoga in there, too. Did you do Easter egg hunts as a kid? I so miss biting off hollow chocolate bunny ears. And jelly beans! Anyway, here are some tips about how to create a "healthier" Easter basket. This website will tell you how much your bad habits are costing you monetarily. Happily, only one applies to me (you can guess which one) but I don't plan on giving it up for the alleged $948 it's costing me per year. Kara Goucher talks Boston Marathon with David Wiley of Runner's World. Why is she so awesome? Why aren't we best friends? *not actually my brother, but I feel like this is something he would totally do. Love that cost saving website! Silly coffee...but I justify that I usually make it at home or work and only buy it on special occasions. Of course, with summer coming I'll probably buy more since I prefer iced coffee! 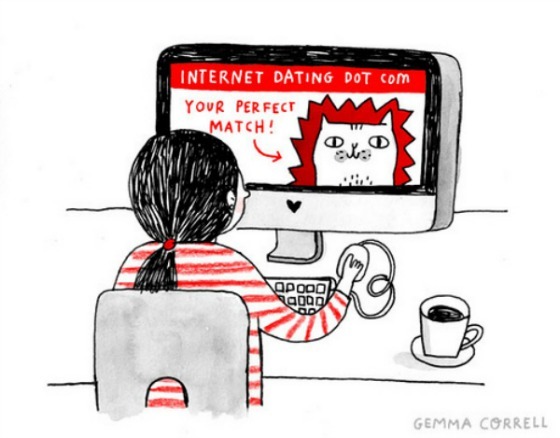 I love the "internet dating" info graphic. Seriously... if I wasn't already married... there is a good chance that be me. Also, I am too afraid to click on the cost saving site. I'd prefer to remain in the dark about my spending habits, but maybe one day.